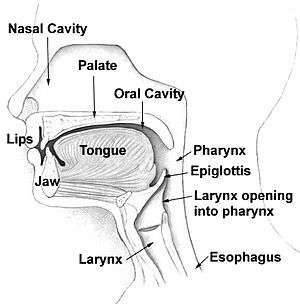 The pharynx (plural: pharynges) is the part of the throat that is behind the mouth and nasal cavity and above the oesophagus and the larynx, or the tubes going down to the stomach and the lungs. The pharynx is an organ found in vertebrates and invertebrates, though the structure is not universally the same across all of those species. In humans the pharynx is part of the digestive system and also of the conducting zone of the respiratory system. (The conducting zone also includes the nose, larynx, trachea, bronchi, and bronchioles, and their function is to filter, warm, and moisten air and conduct it into the lungs.) 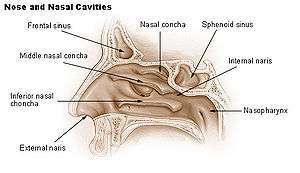 The pharynx makes up the part of the throat situated immediately behind the nasal cavity, behind the mouth and above the esophagus and larynx. 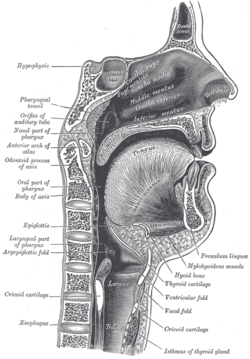 The human pharynx is conventionally divided into three sections: the nasopharynx, the oropharynx and the laryngopharynx. It is also important in vocalization. 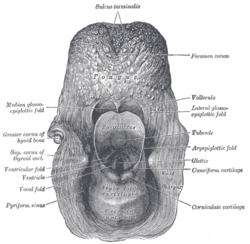 The upper portion of the pharynx, the nasopharynx, extends from the base of the skull to the upper surface of the soft palate. It includes the space between the internal nares and the soft palate and lies above the oral cavity. The adenoids, also known as the pharyngeal tonsils, are lymphoid tissue structures located in the posterior wall of the nasopharynx. Waldeyer's tonsillar ring is an annular arrangement of lymphoid tissue in both the nasopharynx and oropharynx. The laryngopharynx, (Latin: pars laryngea pharyngis), also known as hypopharynx, is the caudal part of the pharynx; it is the part of the throat that connects to the esophagus. It lies inferior to the epiglottis and extends to the location where this common pathway diverges into the respiratory (larynx) and digestive (esophagus) pathways. At that point, the laryngopharynx is continuous with the esophagus posteriorly. The esophagus conducts food and fluids to the stomach; air enters the larynx anteriorly. During swallowing, food has the "right of way", and air passage temporarily stops. Corresponding roughly to the area located between the 4th and 6th cervical vertebrae, the superior boundary of the laryngopharynx is at the level of the hyoid bone. The laryngopharynx includes three major sites: the pyriform sinus, postcricoid area, and the posterior pharyngeal wall. Like the oropharynx above it, the laryngopharynx serves as a passageway for food and air and is lined with a stratified squamous epithelium. It is innervated by the pharyngeal plexus. Pharyngeal cancer is a cancer that originates in the neck and/or throat, and can cause serious clinical problems. It is technically a type of neck cancer or head cancer. 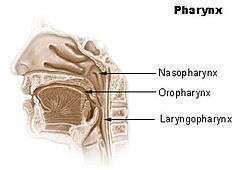 The word pharynx (pronounced /ˈfærɪŋks/) is derived from the Greek φάρυγξ phárynx, meaning "throat". Its plural form is pharynges /fəˈrɪndʒiːz/ or pharynxes /ˈfærɪŋksəz/, and its adjective form is pharyngeal (/ˌfærɪnˈdʒiːəl/ or /fəˈrɪndʒiəl/). 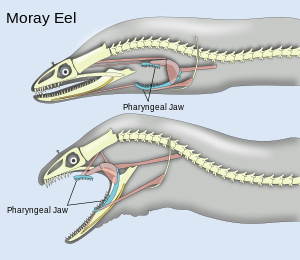 An illustration of the pharyngeal jaws of a moray eel. 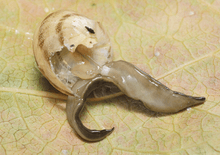 Invertebrates also have a pharynx. Invertebrates with a pharynx include the tardigrades,annelids and arthropods, and the priapulids (which have an eversible pharynx). ↑ FUNCTIONAL ANATOMY OF THE EUSTACHIAN TUBE. CLEVELAND S. SIMKINS, PH.D. Arch Otolaryngol. 1943;38(5):476-484. ↑ Graham, A; Richardson, J (2012). 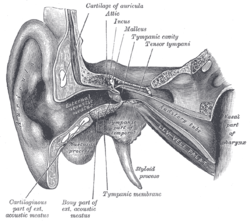 "Developmental and evolutionary origins of the pharyngeal apparatus". EvoDevo. 3 (3): 24. doi:10.1186/2041-9139-3-24. PMC 3564725 . PMID 23020903.